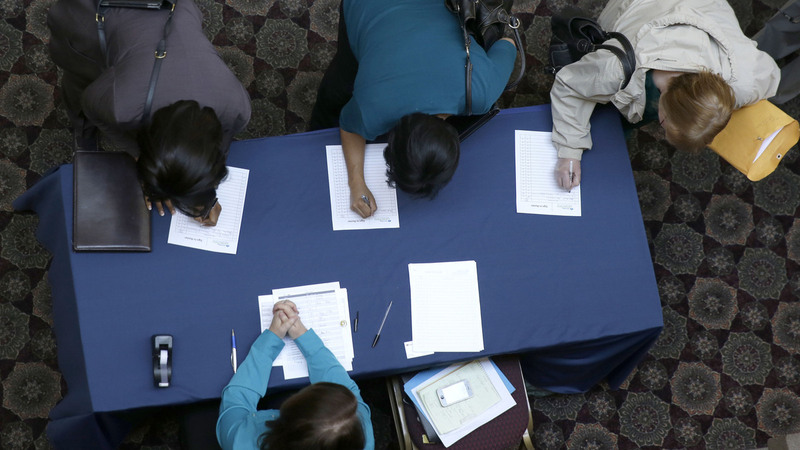 Unemployment Drops To 6.3 Percent, Lowest In 5 Years : The Two-Way U.S. employers added far more jobs than expected — 288,000 — in April, the Bureau of Labor Statistics reports. In a separate survey, the unemployment rate dipped by 0.4 percentage points. Job seekers sign in before meeting prospective employers during a January career fair at a hotel in Dallas. The nation's economy added a robust 288,000 jobs in April, far more than forecast, and the unemployment rate fell to 6.3 percent, its lowest level in five years, according to the Labor Department. The rate, which is the lowest since September 2008, was down from 6.7 percent in March. But NPR's Yuki Noguchi notes that the improvements were offset by questions about why the number of people entering or re-entering the labor force shrank by more than 800,000. Friday's report said the labor force participation rate fell by 0.4 percentage points, to 62.8 percent, in April. Yuki tells our Newscast Desk that the reason for the decline is not well understood. Overall, economists had forecast just 210,000 new jobs last month, citing severe winter weather for the sluggish growth. April represents the largest burst of hiring in months. Figures for February and March were revised upward, giving an average for each of the 3 months of 238,000. In its household survey, the Department said the number of people counted as unemployed fell by 733,000, to 9.8 million. "We may be seeing an acceleration in job growth," Gus Faucher, senior economist with PNC Financial Services, Pittsburgh, was quoted by Reuters as saying. "It's sustainable to have a 200,000-plus job growth over the next six to nine months," he says. "The drop in 800,000 in labor participation is concerning. I don't think that's a permanent event. We will see the workforce expand." According to BLS, gains were seen in every major sector of the economy. -- Professional and business services added 75,000 positions. -- Retail firms increased employment by 35,000 jobs. -- The food and beverage industry added 33,000 jobs. -- Construction companies added 32,000 jobs. -- Health care grew by 19,000 jobs.